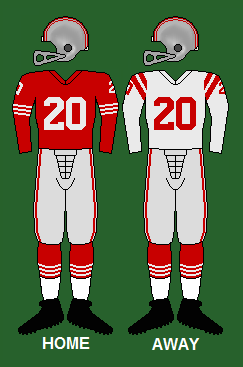 The 1960 San Francisco 49ers season was their 11th season in the league. The team was able to match their 7–5 output from the previous year. However, they again failed to make the playoffs. The season did have a silver lining, though, as the 49ers' defense was top-ranked in the league, allowing only 205 points. The 49ers tied for second place in the Western Conference, but Detroit went to the inaugural third place Playoff Bowl in Miami in January. The teams had split their season series and the Lions won the tiebreaker based on points differential. A bye week was necessary in 1960, as the league expanded to an odd-number (13) of teams (Dallas); one team was idle each week. ↑ "Lions blast Bears, 36–0, face Browns in 'Bowl'". Milwaukee Sentinel. Associated Press. December 19, 1960. p. 3, part 2.